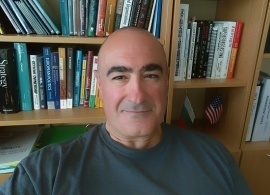 AUBG Business Professor Arthur Pantelides has 25 years of professional experience at leadership positions in engineering, project management, manufacturing, and strategic planning in Asia, Europe and the U.S. His biggest passion, however, is teaching and he uses his practical experience to offer students at AUBG a real-world perspective on the problems discussed in the classroom. 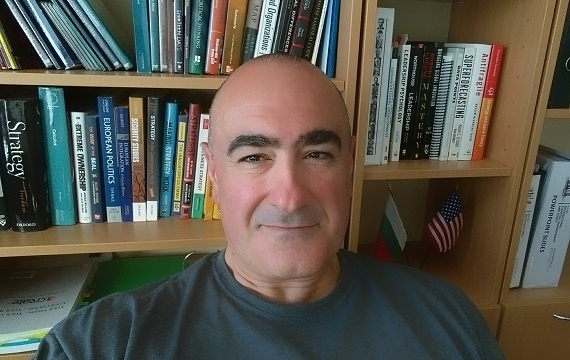 Professor Pantelides also teaches at AUBG’s EMBA Program is Sofia—an experience that reminds him of the times he taught master students at the George Washington University in DC. Where are you from? Where have you studied? I was born in Athens, Greece but my parents and sisters and I immigrated to the U.S. in the 1970s and I grew up in Boston. I studied Aerospace Engineering at Boston University and later went back to school to get my Ph.D. in Management from The George Washington University in Washington DC. My career has been mainly with Japanese companies, so this is the corporate culture I know best. So, in the end, I consider myself a sort of internationalist, combining European, American and Asian influences. You have over 20 years of professional experience. Could you tell us more about the jobs you’ve had? After I got my Engineering degree I started working right away as a design engineer; I was the first local American in my Japanese company’s engineering department. But within about six months my responsibilities switched to hiring, expanding, and managing the department; so actually, from the very beginning of my career, I focused on management. I’ve had positions as R&D Manager, Engineering Manager, VP & General Manager, and Senior Director for Strategic Planning & Control. All my jobs focused on international operations managing different team members from around the world including the USA, Mexico, Italy, Japan, and other countries where I’ve worked. Recently in addition to my wonderful job here at AUBG, I also spend time consulting throughout Central and Eastern Europe, as well as the UK. In what ways does practical experience complement teaching? I really feel that the years I spend actually working in the industry, interacting with real-world problems, opportunities, and locations, with a multitude of people, employees, bosses, customers, suppliers, and others around the world, has enabled me to experience management from different angles under different circumstances and situations. I use this experience in the classroom, providing a sort of “real-world” practical perspective to the actual “book theory” we study. I honestly believe that my students really enjoy hearing about my experiences in relation to what we study. What are your favorite teaching topics and why? Strategy – because it is EVERYWHERE. I define strategy as decision-making to shape your future, whether at the corporate level or all the way down to your own personal level strategy. The decisions we make eventually shape our future and this is why I love the topic so much. I also love to teach Leadership – because I believe that it is a very important topic that can have a tremendous impact on our lives. Leadership is a way to improve personal, social, and professional lives (this is the internal aspect) and also it is a way to improve how one presents themselves to others (the external aspect of leadership). Besides these two topics, I am now starting research in other more “exotic” areas like game theory and security issues and eventually, I would love to establish some specific courses here at AUBG. What led you to AUBG? I decided to make a career change after about 25 years working in the industry. I wanted to focus on teaching which is something I love to do as opposed to working for a sort of a “faceless” company – now I see myself as working for future leaders and professionals (my students). So I started looking for opportunities to teach and utilize my Ph.D. in management. I specifically wanted to work in Europe because at the time I started consulting in the region and this really took off fairly quickly. I liked working for myself as well. I saw the opportunity at AUBG to teach exactly what I have been doing for many years and to a very international group of young people, and besides it was right next door to my home in Athens…so, a no-brainer. I’ve been immensely happy ever since. What is your favorite thing about teaching to BA students? When I was interviewed here I did it over International Week and had the great opportunity to see the tremendous talent our students have. I was super impressed. You have to understand that I came from a huge research university with more than 30,000 students and almost 3,500 faculty members, while here it was small, liberal arts, and students enjoy trying so many things to create a unique learning experience whether through their majors or university clubs, activities, and other social opportunities here. These opportunities that are provided, along with the fact that the students here are super talented, eager to learn and better themselves, is the most attractive and rewarding part of being here. You also teach Business Strategy in the EMBA program-- what do you enjoy about teaching to EMBA students? Teaching EMBA reminds me very much of teaching masters students at the George Washington University in DC. Our EMBA students are global professionals who can have a stronger appreciation for what it means to have working experience. Teaching in this program provides me with a little bit of a reality check with what is happening in the industry and thus actually enables me to learn also from those professionals/ students as well as teach and interact with them: it’s a give-and-take opportunity. What advice would you give a recent graduate on building a fulfilling life and career? Well, I tell my students that in the end, it is really not about the money, happiness is not money…but then I stop myself and realize that most of our students starting off (as I did 25 years ago) do focus on a career that can be rewarding financially and may do whatever it takes for that. So, my advice then shifts to this: work hard, earn your financial rewards but do not lose sight of the things in life such as health, happiness, friends, family, love. Do what you must to earn your career with minimal sacrifice for these other important things in life. Work hard, be flexible, save, live within your means, and before you know it, you will be able to one day make a STRATEGIC decision to follow your passion and do what you really truly love. Just as I did. What has been your experience living in Bulgaria? I’ve actually lived and spent a good amount of time in Japan, Mexico, Italy, Germany and other places besides the U.S., and in all of those places, I did not feel at home, at least at first. I went through various degrees of culture shock, but here in Bulgaria….it’s like living at home in Greece. In fact, I consider Bulgaria my “Third Home” after the U.S. and Greece, whereas the other places I mentioned, they were just workplaces. I feel I’ve adjusted here very well, very quickly. The people are friendly and hospitable, the food is close to the Greek food which I’ve known all my life; and this country, Bulgaria, is incredibly beautiful with such a rugged natural landscape. And, yes, even Sofia, if you are kind and respectful of your situation (as a foreigner, for example, not knowing too much the language) the people can be very friendly and helpful towards you.